Shortly before his death from lung cancer in June 1996, Bill Emerson asked his wife to consider taking his seat, a request repeated by his staff and constituents.3 Emerson agreed, and her first campaign reflected her husband’s conservative philosophy and skills as a consensus builder. Her slogan was “Putting People First.” And she said that she planned to make the seat “a living memorial to Bill.”4 For a role model, Emerson looked to family friend Lindy Boggs, who had served with distinction in the U.S. House for nearly two decades after succeeding her husband in 1973, when he was killed in an airplane crash.5 Two elections were scheduled for the same day that following November: a special election to complete the last two months of the 104th Congress (1995–1997) and an election to a full term in the succeeding Congress. Jo Ann Emerson received the Republican nomination for the unexpired term, but for the general election, Missouri election officials ruled that she was ineligible to run as a Republican. Richard Kline, who had already filed in the GOP primary against Bill Emerson, took the Republican slot on the general election ballot. Accordingly, Jo Ann Emerson formally entered that race as an Independent, though always affiliating herself with Republicans. Emerson won the special election with 63 percent of the vote and simultaneously won the full term with 51 percent. In each of her eight re-election campaigns, Emerson was returned to office without difficulty, consistently capturing about 70 percent of the vote.6 In January 2000, Emerson married St. Louis labor lawyer Ron Gladney. Emerson has six stepchildren, two with Bill Emerson and four with Gladney. 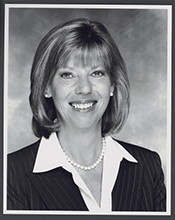 When Representative Emerson entered the 105th Congress (1997–1999), she received assignments to three committees: Agriculture, Small Business, and Transportation and Infrastructure.7 In the 106th Congress (1999–2001), Emerson earned a seat on the exclusive Appropriations Committee which required her to give up her other assignments. She subsequently served on numerous Appropriations subcommittees, ranging in jurisdictions from Agriculture to Energy and Water Development. She became an Appropriations subcommittee chairman, or “cardinal,” during the 112th Congress (2011–2013)—leading the Financial Services and General Government panel. 1Lloyd Grove, “The Congresswoman’s House of Memories; Jo Ann Emerson, Following in Her Husband’s Footsteps,” 27 November 1996, Washington Post: B1. 2Politics in America, 2004 (Washington, D.C.: Congressional Quarterly Inc., 2003): 590–591; Congressional Directory, 108th Congress (Washington, D.C.: Government Printing Office, 2003): 153. 5Lorraine Adams, “Keepers of the Flame,” 1 November 1998, Good Housekeeping. 6“Election Statistics, 1920 to Present,” http://history.house.gov/Institution/Election-Statistics/Election-Statistics/. 7Since the 104th Congress (1995–1997) had already adjourned sine die at the time of her special election, Emerson was not assigned to any committees. 8Deirdre Shesgreen, “Emerson Says Cuba Visit Was Productive Despite Failure to Get Results,” 17 April 2001, St. Louis Post-Dispatch: A4. 9James Collins, “Rep. Emerson Suggests Strong Link Between Hunger, Terrorism; Feeding Children Abroad Is Good for U.S. Farmers, National Security, She Says,” 5 July 2002, St. Louis Post-Dispatch: A5. 10Deirdre Shesgreen, “Rep. Emerson Has Conservative Record, with Some Surprises,” 17 October 2000, St. Louis Post-Dispatch: A13. 11Congressional Record, House, 109th Cong., 1st sess. (24 May 2005): H3830. 12Jon Sawyer and Jessamyn Blau, “Prescription Drug Vote Came Down to Emerson, Push for Reimportation; Missouri Republican Believes Measure Could Save Billions in Drug Costs,” 29 June 2003, St. Louis Post-Dispatch: A5. 13Congressional Record, House, 108th Cong., 1st sess. (21 November 2003): H12296. 14Politics in America, 2012 (Washington, D.C.: Congressional Quarterly Inc., 2011): 570. 15Seung Min Kim, “Jo Ann Emerson to retire in February,” 3 December 2012, Politico, http://www.politico.com/story/2012/12/jo-ann-emerson-retiring-84508.html (accessed 29 May 2013). 16Congressional Record, House, 113th Cong., 1st sess. (22 January 2013): H200. Papers: 1996-2013, ca. 100 boxes. More than 100 boxes of material from Emerson's tenure in the House of Representatives from 1996 to 2013, including press releases, hearing booklets, correspondence, speeches, videotapes, and approximately 11,000 photographs. "Jo Ann Emerson" in Women in Congress, 1917-2006. Prepared under the direction of the Committee on House Administration by the Office of History & Preservation, U. S. House of Representatives. Washington: Government Printing Office, 2006.